As I was walking through the store yesterday I stopped to look at some of the completed models that customers have placed in our display case over the years. One of the things that have always fascinated me are the ship models. Here are three of them. 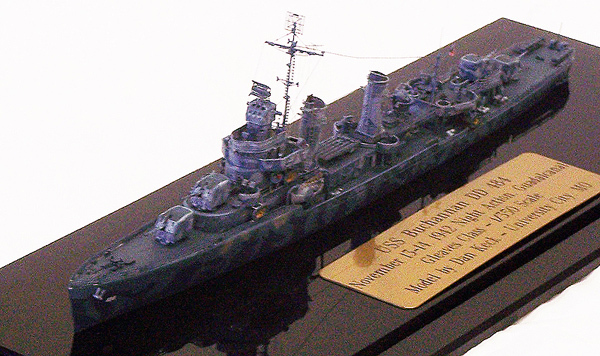 The first is the Fujimi 1/350 scale model of the Imperial Japanese Navy battleship Kongo, built by Allan Bone of O’Fallon Missouri. Allan built this model from the Fujimi kit and added etched metal detail parts and a laser cut wood decking material along with a lot of hard work. The next model, while only being about half the physical size or so is still the same scale of 1/350. This is the IJN Yukikazi. This Kagero Class destroyer was built using several kits for parts and many etched metal and hand made detail parts. The model is configured for Operation Ten-Go on April 6th & 7th, 1945. The late Dan Keck of University City Missouri was the builder. Dan was an exceptional ship model builder. And the last to be seen in this post is another model by Dan Keck. This is the USS Buchanan DD 484 as it appeared November 13 and 14 1942 during night action at the Battle of Guadalcanal. Please excuse the pictures, hopefully I will do better next time. These models show you just what can be accomplished with the different kits that are available, along with patience and research.